These two vintage ensembles are the same, with the hat and camera removed from the renamed version in 1966. The dress has a floral silk bodice with clear glitter accents. The jacket closes in the back and has green satin trim. Both the pillbox hat and jacket have the same cluster of blue flower buds and greenery. This is a very popular ensemble with collectors and can be hard to find, especially the hat. 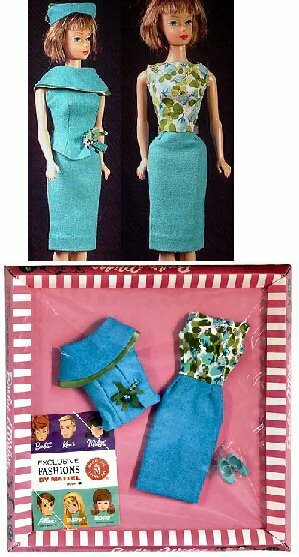 In 2007, Mattel issued the Sleepytime Gal Reproduction, which includes a reproduction of Fashion Editor.